Small businesses are often disappointed that their new business premises do not have NBN. The media tells us others are disappointed that they do! The slowly building rollout and our own good experience suggests that there is sunshine in the NBN world. 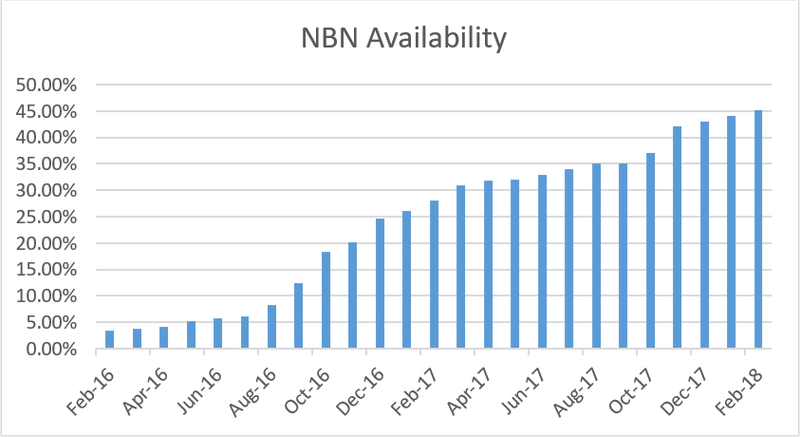 NBN availability is increasingly becoming an important business requirement. Commercial Property Guide’s monitoring reveals that about 45% of all commercial listings now have NBN available. Penetration in business areas has been steadily increasing recently after a slow growth period for most of last year. Unfortunately our community conversation is not about the business benefits of NBN, but rather our attention is firmly focused on poor service delivery, high cost and other NBN operational defects. Commercial Property Guide’s survey of commercial real estate agents disclosed 92% of property seekers include NBN as a criteria for a business location. A further 58% of their clients were keen to know the type of technology NBN were using at their property of interest. There are two factors that are slowing NBN take-up by business: • Slow NBN rollout in commercial property precincts that is gradually getting better; and • Businesses are troubled by the adverse media attributed to NBN and are reacting by delaying to connect. NBN Co’s rollout strategy results in offices, retail strips and industrial hubs closer to the city centre having very little NBN coverage, while outer suburbs and country areas have been well served by NBN. The rationale behind this is based on the NBN charter to cover areas with historically weak high speed internet availability. One downside of the NBN Co rollout plan is that the CBD of Melbourne and to a lesser extent Sydney are largely NBN-free zones - Melbourne (3.9%), Sydney (25.48%) and North Sydney (31.0%). NBN Co is now being more transparent about the type of technology at each commercial property site. 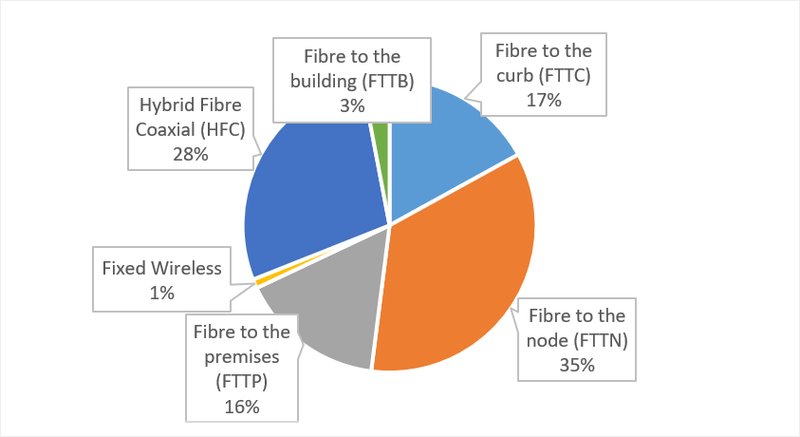 Sixty-one percent (61%) of commercial premises will get NBN via a legacy system of either copper wire or Foxtel cable (currently still on “stress leave”). Property seekers can now adjust their NBN long-term speed expectations downward at those locations. The NBN critics argue that the result of using legacy technologies is that potential upgrades to a world-class giga-bit NBN service will only be available to a small percentage of commercial premises (36%) – those with either optical fibre to premises or Fibre to the Curb (considered the best value in terms of trade-off between cost and performance). Instead of discussing what applications business can use to take advantage of the NBN, the conversation centres around the merits of using legacy technologies - either Foxtel HFC cable or the second-hand Telstra telephone cable. Commercial Property Guide’s Apps conveniently developed for iOS and Android can filter out properties without NBN before engaging with a commercial real estate agent – saving time and frustration. However, the real story for small business is the business benefits, both direct and indirect, that NBN can deliver. In our own experience, even the often belittled “Fibre-to-the-Node” 100Mbps NBN is a stunning improvement over the old ADSL service. The direct benefit is that of high-speed uploading. This enables the instant transfer of image libraries, synchronisation of Drop Box folders and similar applications that are a boon to small business. This is a very different requirement from consumers, who mainly download entertainment content. The indirect benefits of NBN are just as important. NBN enables small business to compete for talented staff by offering a better work-life balance. Our business has experienced first-hand staff functioning fully from home. An office and home connected by 100 Mbps NBN connection allows our staff in the outer suburbs to work from a home office. This results in zero commute time, a better work-life balance and optimal productivity for both employee and organisation. It is time to look at the NBN through business eyes. In doing so we realise NBN’s transformative potential is available now. There is no need to wait for the NBN business model to be fixed or the distraction of the political and media discussion to move on. NBN can be an innovation driver for business anytime we choose.